Hey, Cowgirl, Need a Ride? is Baxter Black's second novel. For those of you who have read his first, Hey, Cowboy, Wanna Get Lucky?, you will be pleased to know that Lick and Cody are back again. 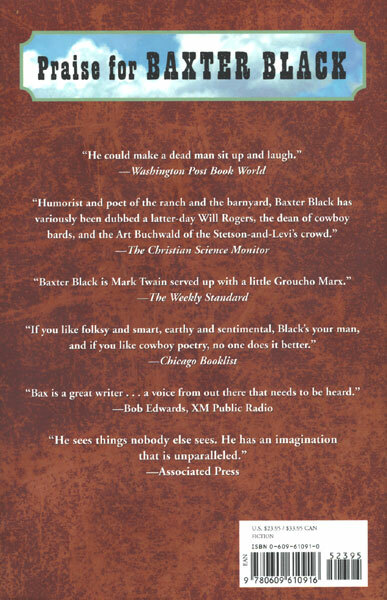 In typical Baxter Black fashion, the novel involves Lick, the NFR Champion Bull Rider, paired up with ornery old Cowboy Al Bean. They're cowboying in the Nevada Desert when a plane crash introduces them to the world of Teddie Arizona, a damsel in distress. The rest of the novel involves the illustrious struggle of the cowboys and their friends to help T.A. and hopefully come out alive. 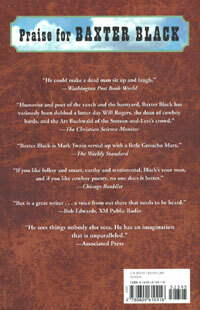 Those of you who are familiar with Baxter Black's poetry will love his novels, too. They contain the same creative language and crazy happenings that characterize the way of life many of us love and still more envy.